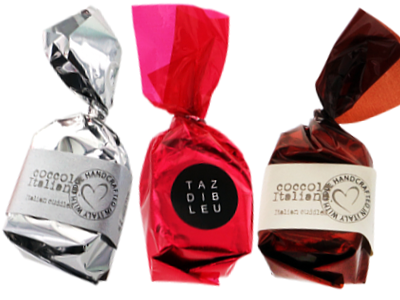 Pralines filled with hazelnuts, nougat or rum centres with paper band or adhesive label. Brown polypropylene (hazelnuts), silver polypropylene (nougat), red polypropylene (rum). Digital printing on white/ivory/opaline/metallic silver/sand/pearl paper band or on a rectangular or round (2.0 cm diameter) white adhesive label.